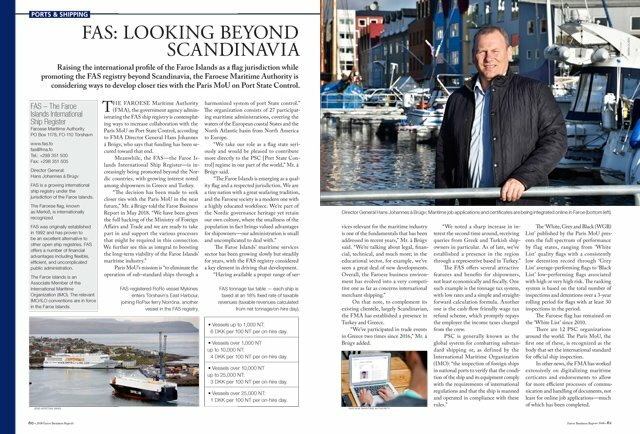 Raising the international profile of the Faroe Islands as a flag jurisdiction while promoting the FAS registry beyond Scandinavia, the Faroese Maritime Authority is considering ways to develop closer ties with the Paris MoU on Port State Control. The Faroese Maritime Authority (FMA), the government agency administrating the FAS ship registry is contemplating ways to increase collaboration with the Paris MoU on Port State Control, according to FMA Director General Hans Johannes á Brúgv, who says that funding has been secured toward that end. Meanwhile, the FAS—the Faroe Islands International Ship Register—is increasingly being promoted beyond the Nordic countries, with growing interest noted among shipowners in Greece and Turkey. Paris MoU’s mission is “to eliminate the operation of sub-standard ships through a harmonized system of port State control.” The organization consists of 27 participating maritime administrations, covering the waters of the European coastal States and the North Atlantic basin from North America to Europe. “We take our role as a flag state seriously and would be pleased to contribute more directly to the PSC [Port State Control] regime in our part of the world,” Mr. á Brúgv said. The Faroe Islands’ maritime services sector has been growing slowly but steadily for years, with the FAS registry considered a key element in driving that development. On that note, to complement its existing clientele, largely Scandinavian, the FMA has established a presence in Turkey and Greece. “We’ve participated in trade events in Greece two times since 2016,” Mr. á Brúgv added. The FAS offers several attractive features and benefits for shipowners, not least economically and fiscally. One such example is the tonnage tax system, with low rates and a simple and straightforward calculation formula. Another one is the cash-flow friendly wage tax refund scheme, which promptly repays the employer the income taxes charged from the crew. The ‘White, Grey and Black (WGB) List’ published by the Paris MoU presents the full spectrum of performance by flag states, ranging from ‘White List’ quality flags with a consistently low detention record through ‘Grey List’ average-performing flags to ‘Black List’ low-performing flags associated with high or very high risk. The ranking system is based on the total number of inspections and detentions over a 3-year rolling period for flags with at least 30 inspections in the period. The Faroese flag has remained on the ‘White List’ since 2010. There are 12 PSC organizations around the world. The Paris MoU, the first one of these, is recognized as the body that set the international standard for official ship inspection. In other news, the FMA has worked extensively on digitalizing maritime certificates and endorsements to allow for more efficient processes of communication and handling of documents, not least for online job applications—much of which has been completed.